Read also: "Transition Offense" and "Press Break". Use this secondary break to transition quickly up the floor after the opponent scores, or after getting possession by either a rebound or steal. The idea is to push the ball up the floor as quickly as possible, before the defense can get set. You can even use this as a press breaker if you get it in quickly, before the press has time to get set. The keys are: get the ball out of the net quickly and pass in-bounds immediately to the point guard (O1), your best ball-handler. O2 and O3 sprint down the sidelines into the forecourt. 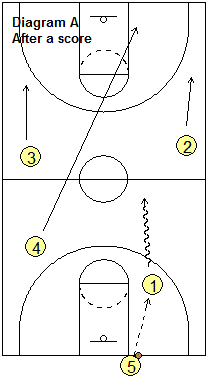 O1 will either speed dribble the ball up the floor, or make the long pass to O2 or O3. Then there are a number of options as outlined below. O5 always makes the in-bounds pass, and after a made basket, should quickly get the ball out of the net (don't wait for it to hit the floor), step out-of-bounds, and quickly get the pass into O1. Don't waste time and let the defense get their press set. Notice how the floor is spread, with O1 and O2 on the right, and O4 and O3 on the left. O2 and O3 should get down the floor. O4 plays opposite of O1. O5 will be the trailer coming down the floor last. O4 will cut to the ball-side block. O5, the trailer, comes last and goes to the opposite side elbow. There are many options depending on what the point guard finds open. 1 all the way - O1 can take it all the way to the free throw line for a 3-on-1 break. 1 to 2 - O1 passes long up the side to O2, who takes it to the hoop. 1 to 3 - O1 passes long to O3, who takes it to the hoop. 1 to 4 - O1 passes long to O4 (going to the ball-side block), who takes it to the hoop. 1 to 5 - O1 passes to the trailer O5, at the elbow. 1 to 2 to 4 - O1 passes to O2. O2 passes to O4 down on the low block. 1 to 2 to 5 - O1 passes to O2. O2 passes to O5 at the elbow. 1 to 2 to 5 to 3 - O1 passes to O2. O2 passes to O5 at the elbow, and O5 passes to O3 cutting to hoop. If nothing develops, then flow into your half court offense. Everyone goes for the defensive rebound. As soon as the rebound is secured, O2 releases up the right side-line, O3 sprints up the left side-line, and O1 comes to the top, ball-side for the outlet pass. Usually the defensive guard that plays "back on defense" will back-pedal to the center of the court. By having O2 and O3 wide on the side-lines, you should be able to get the pass down floor. O1 pushes the ball up the floor, or can make the long pass to either O2 or O3. O4 runs the same pattern as in diagram A, and O5 becomes the trailer again. You could reverse the roles for O4 and O5, depending on who gets the rebound... allowing the rebounder to be the trailer. The patterns and options are the same in both situations, so it is not difficult to learn this secondary break. with Tom Izzo, Michigan State University Head Coach. By Roy Williams, University of North Carolina Head Coach. with Larry Brown, SMU Head Coach; Basketball Hall of Fame; former head coach at University of Kansas, Detroit Pistons and Charlotte Bobcats.